The Conservatives are interested in our views about the fairness of their benefit reforms! We’re interested in what your[sic] think about benefits. That’s why we’re asking you whether or not you support two fundamental principles upon which our welfare policies are founded – many will say they don’t but many will also be in favour. Your responses will tell us what the majority think. How do you think we could make the benefits system fairer? Mandate a living wage: end workfare & other anti-employment practices: build enough council houses for everyone to have somewhere to live: fund welfare programmes to support the unemployed, disabled, and ill – the basic infrastructure of a civilised state. Feel free to leave what you said here as a comment as well as there in their form, if you want a record somewhere the Tories can’t delete it. Or better yet use Twitlonger. How has welfare-to-work become big business? @chrissieoap I’d encourage them to email me because the emails I’ve received in last 24hrs have been supportive of it. As are 59% of public. So if you oppose the idea of a smartcard that ensures the children of poor people won’t get toys, or access to museums, or books, or any food except approved items bought at approved shops, do write and let him know specially. Benefits are claimed by people in work, not just unemployed. Housing benefits go in the pockets of greedy landlords not “scroungers”. How about building real affordable social housing and imposing a decent living wage? This would surely alleviate the burden on the tax payer. Low wages are a reason to KEEP benefits in-line with inflation – many people on benefits work, & will suffer doubly. Maybe you could stop misrepresenting & demonising the sick & un(der)employed & using them to distract hardworking folk from your hideous, ideological attack on the welfare state. That the Azure Card exists at all, for anyone, is a stain on our welfare state and on our conscience as a nation; I only wish that more people knew about this hideous, dehumanising and badly administrated piece of policy so that it would receive the outrage it deserves. Your proposal to roll this out to more benefits claimants doesn’t surprise me particularly as it comes as the latest in a long line of this government’s recent attempts to dehumanise and demonise the poor and sick, and to turn them into scapegoats to be attacked by the ‘striving’ poor. Know that history will judge you harshly – and I’m judging you now. Shame on you. In accordance with Parliamentary protocol, we are required to request your full name and address. On receipt of this information we will ensure Mr Shelbrooke responds to your personally. Mr Shelbrooke actually ‘openly’ requested emails from his own constituents on the matter as one individual on Twitter suggested his constituents weren’t supportive, which was a suggestion not reflective in the emails Mr Shelbrooke has received from his constituents. I will pass on your comments to Mr Shelbrooke for consideration as he drafts his Second Reading. Are his proposals only to affect his constituency, then? Alec Shelbrooke will be cynically aware that a policy proposal put forward by an MP who’s just one step up from backbencher, doesn’t stand a chance of actually being rolled out across the whole of the UK. 1) To the Conservative/LibDem government, it shifts the Overton Window over. Policy proposals for the unemployed that are not quite as bad as that look better by comparison. -(b) Given that his constituency, Elmet and Rothwell, has a 1.9% unemployment rate (substantially below the national average) the people who will be voting for him in 2015 are pretty much not going to be people who are unemployed or who know someone who is, certainly not the kind of people who would know anyone on an Azure Card. Oh, totally! I was just amused by getting snotty responses from his staff. “You kept saying, on Twitter, that if people on benefits were forced to use a card that would block specific purchases that you felt they should not have, this would “prove” that unemployed people weren’t feckless. There already is a card in use for that purpose, the Azure card, which is given to failed asylum seekers who have managed to delay their expulsion. 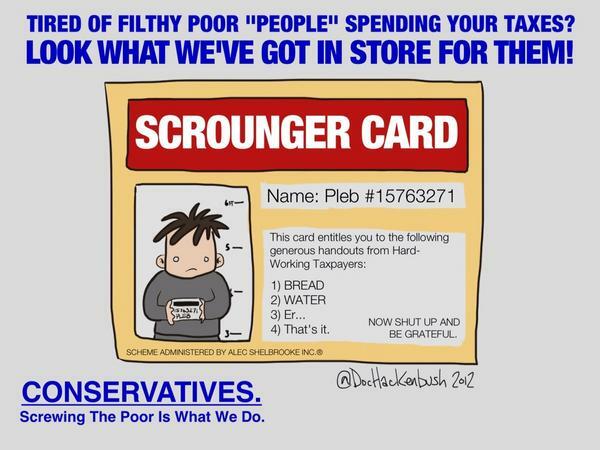 It might well be possible to roll this card out across all benefits claimants. Then they would have to walk miles to the nearest approved supermaket (you can’t use an Azure card for bus fares, and it can only be used at a specific range of shops), If they have children too young to make the walk, the children will have to stay home on their own, unless there’s a neighbour willing to look after them for free. You can’t use an Azure card to buy clothes, so the children go to school – if they can – dressed in whatever could be found for them at the clothes bank. When I was unemployed, which was over twenty years ago, I recall well how – with £10 to buy necessities – one becomes an absolute expert on which shops sell the cheapest milk, the cheapest bread, which local groceries will be bagging their bruised fruit and veg for sale at bargain prices. I could do that because I had *cash* – I could go from one shop to another, buying items exactly where I had learned they’d be cheapest. And yes, I could still afford – sometimes – to sit in a cafe with a friend, with a single cup of coffee, talking and getting cheered up. You may think it was unconscionable of me to have bought a coffee when I could have spent the money on something sensible, but I assure you, when unemployed, spending time with friends who are happy to see you is one of the things that keeps you going. All of that, your idea would take away from people whose only crime is to have lost their jobs. There are unemployed parents who smoke because tobacco dulls hunger and they are skipping meals to make sure their children get enough to eat. I don’t have words to describe how angry I am that while you would find it delightfully acceptable – if they got a job in a pub/club – to force them to breathe second-hand tobacco smoke, while smilingly refusing them access to tobacco when on the dole. We already know how the Azure Card works for asylum claimants: it keeps them permanently in a state of destitution and deprivation, a life of misery with not enough and no prospect of more. I have no idea how you think enforcing this on claimants would do anything but ensure losing your job dropped people at once into an underclass.